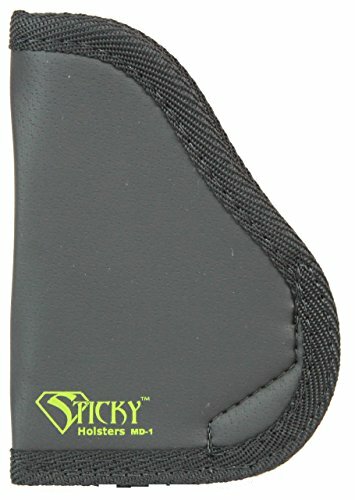 The Sticky Holsters allows for quick deployment and adjustment of a firearm in seconds. No bulky clips or straps to get in the way. This lightweight holsters weigh less than 3 ounces, and the closed-end design keeps lint and dust out while keeping gun oil off the user. Body heat and use conforms holster to the gun, so the holster fit will continue to improve with use. It is also an ambidextrous holster with optimal access for left or right hand users. Suitable for single stack Sub-Compact Medium autos up to 3.6 inch barrel. Such as Springfield xds(3.3), Glock 43, S&W shield, and other makes/models with similar frame size.